Gardner Park was the site of the 2017 season-opening game for the Washington Blue Lions and the Blanchester Wildcats on an unseasonably mild last Friday in August. After a good bit of back and forth in the first quarter, the game settled down and the Blue Lions took care of business, posting a 42-26 victory. Blanchester drew first blood with a 22-yard run by Brent Hopkins with 5:01 to play in the first quarter. Washington soon had a 60-yard touchdown run by quarterback Dillon Steward. Nick Bishop’s kick gave the Blue Lions a 7-6 lead. Jacob Burden returned the ensuing kickoff back 85 yards for a touchdown. The pass for the conversion failed. Steward closed out the scoring in the first quarter with a 31-yard touchdown run. Bishop’s boot made it 14-12, Washington, which was how the first quarter ended. The Blue Lions seized the momentum in the second quarter with three touchdowns to take a 35-12 halftime lead. Steward connected with Eli Lynch for touchdown passes first of 53 and then 18 yards. Steward passed to Eli Ruth for a touchdown of three yards. That score came about as a result of Washington’s Jalen Pettiford recovering a Wildcat fumble near midfield with just under a minute to play in the first half. In the third quarter, Washington scored what would prove to be its only touchdown of the second half, a 26-yard pass from Steward to Lynch. Burden disdained the punt and ran 78 yards for a touchdown with 10:09 to play in the fourth quarter and Brayden Sipple had an 18-yard score with 2:13 to play in the game. 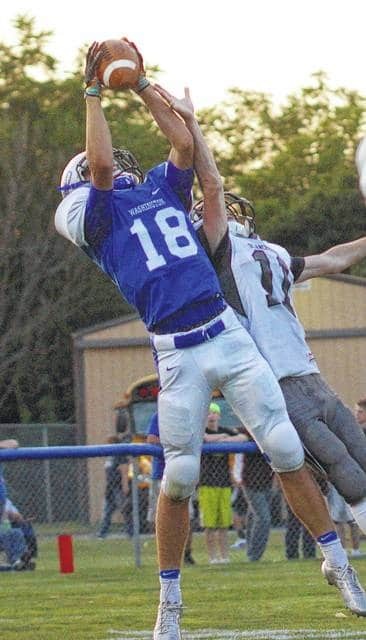 “We have three returning starters and a freshman quarterback,” Blanchester head coach Brandon Sammons said. “We have a lot of young guys playing in key spots. They got a dose of what Friday night football is all about. “We knew coming in we were going to have our hands full with a big, athletic team,” Sammons said. “No. 4 over there (Caleb Rice, who made six catches on the night) is a heck of a receiver. Taking a look at the statistics, Washington accumulated 520 yards of total offense to 413 for Blanchester. The rushing totals were very similar, as the Blue Lions carried 29 times for 240 yards and two touchdowns. The Wildcats had 30 rushes for 236 yards and three touchdowns. Blanchester completed 19 of 34 passes for 177 yards with no touchdowns and no interceptions. Washington, who used three quarterbacks on the night, Dillon Steward, Richie Burns for one play and Ethan Rogers-Wright, completed 20 of 35 passes for 280 yards with four touchdowns (all by Steward) and two interceptions. First downs were 18 for Washington to 17 for the Wildcats. Penalties were not likely to make head coach Chuck Williamson too happy as the Blue Lions were flagged 12 times for 115 yards. Blanchester was penalized six times for 60 yards. Each team had one quarterback sack. Washington will be on the road next week at Circleville, while Blanchester will have its home opener against Mariemont. Circleville defeated Miami Trace Friday, 41-14. Chillicothe beat Teays Valley, 31-27; Adena blanked Mcclain, 27-0; Hillsboro topped Western Brown, 55-34. Washington Blue Lion sophomore Eli Lynch (18) goes up for the catch, one of seven on the night, in a 42-26 season-opening victory over the Blanchester Wildcats at Gardner Park. Lynch had three touchdown catches in the game. https://www.recordherald.com/wp-content/uploads/sites/27/2017/08/web1_Eli-Lynch-catch-pic-1.jpgWashington Blue Lion sophomore Eli Lynch (18) goes up for the catch, one of seven on the night, in a 42-26 season-opening victory over the Blanchester Wildcats at Gardner Park. Lynch had three touchdown catches in the game.